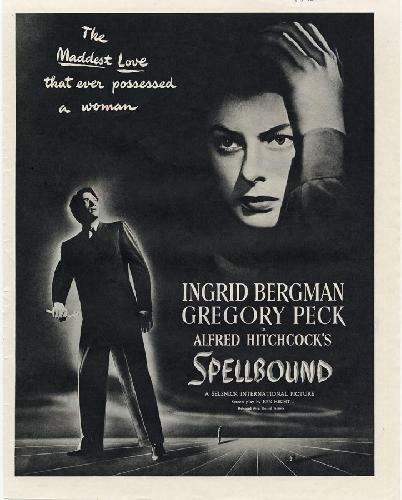 Continuing my Alfred Hitchcock spree for Readers Imbibing Peril, I next watched Spellbound with Ingrid Bergman and Gregory Peck. With the tagline, “Will he kiss me or kill me?” it’s proof that stories about women falling for possibly murderous men date back well before certain vampire novels I could name! Bergman plays Dr. Constance Petersen, a coldly self-contained psychiatrist who falls for her facility’s new director (Peck), who falls just as hard for her. When he suffers a breakdown, it comes out that he’s an imposter; in reality he’s an amnesiac, convinced that he killed the man whose identity he assumed. Constance adamantly believes that he’s innocent and suffering from a guilt complex; the two go on the run, trying to learn what happened in his past. This isn’t one where I’m going to rave about the plot, because, um, it’s kind of mad. At one point a character tells Constance, “you’re a brilliant analyst but a very stupid woman,” and unfortunately it seems to be true (for what it’s worth, in an interview Hitchcock described Constance as “very brave”). She takes wild risks and engages in extraordinarily unprofessional behavior–guided, of course, by her heart. Hmm, I seem to be a bit of a cynic about the whole thing! While the plot and the main character are questionable, I love the atmosphere of the movie. The first time I saw it, I remember being utterly fascinated by the shadows and the shades of gray. It might sound strange, but Hitchcock cast shadows across faces in wonderful ways, and all those shades of gray in the black-and-white film contribute to a marvelous dreamy quality. The music is also a big part. I honestly can’t remember if there was much of a soundtrack to Rope or Strangers on a Train, even though I just saw them, but in this one the music was perfect for increasing the tension in key moments. We also see again Hitchcock’s ability to raise tension without any blood or dramatic conflict. Peck gets a wild look in his eye, and that’s enough. There’s a very good scene where he becomes fixated on a knife Constance is using at dinner. There’s no dialogue about it, but we see him seeing, and we see her seeing him seeing, and then a noise jolts him out and things are all right again. Hitchcock also seems to have a thing about characters on staircases. Cary Grant in Suspicion comes to mind, or there’s a terrifying sequence in Psycho. Spellbound has two scenes with characters on staircases that are wonderfully tense even though nothing is really happening–although in one of them, Peck is carrying an open razor. Still, you don’t need the blood of Sweeney Todd–just carrying it is tense enough. Though that does bring me back to Constance being very stupid. I know he’s handsome Gregory Peck and therefore has to remain handsome and clean-shaven, but why did she leave a razor where a possible psychotic could get it??? Anyway…one of the more famous sequences in this is the dream sequence. It’s very surreal (in the Surrealist sense), and you can definitely tell that Salvador Dali was an adviser for that part. It didn’t look like any dreams I’ve ever had, but it’s a great bit anyway. This one doesn’t come in at the top of my list of Hitchcock films…but I do love Bergman and Peck and that wonderful Hitchcockian atmosphere! I remember seeing this film a long time ago. I really should re-visit it. The dream sequence is pretty strange, as I recall. Hitchcock was such a master of how scenes LOOKED. This was integral to telling his stories, in “Spellbound” and in others.